Aubrey is alone, with only her position as psychic consultant to law enforcement to distract her from the fact that her husband Levi has taken their son away in the hope that he can somehow circumvent the inherited psychic ability unfolding in frightening ways in their only child. 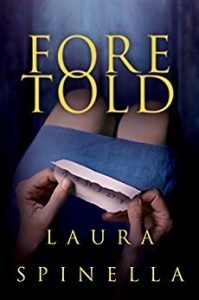 As Levi reports on a mysterious murder connected to a crime family, Aubrey reconnects with Zeke, her first love, who visits her unexpectedly, and has always understood her psychic power better than anyone, perhaps even her spouse. Levi suspects her friend is involved in the homicide, but Aubrey knows better, as their jobs lead them to the same crime. Spinella keeps the reader guessing about Zeke’s motives and actions. When their son is kidnapped, Levi questions Aubrey about Zeke, but she maintains focus, and they reunite to save him. The Ghost Gifts series presents ghosts as an actuality, invisible to all but a few. Complex characters play out complicated dynamics with psychic ability at the core of the conflict. Spinella carefully weaves it into the story as one more thing to deal with in the life of Aubrey and her family. She is considered a paranormal romance writer; however, her stories are fantastic mystery thrillers, as well as unique ghost stories. Laura Spinella gifted me an autographed copy in a giveaway and I love it!